Earlier topic: Is this Ronaldson? I will be taking a relief printing class at the college in the spring and it would be nice to get this machine working again. I am no expert, but I would guess it is a Kelsey side lever press, possibly a 6x10 (with the little scale information available) but which model I have no clue. Todd from Todd’s press time can probably make you rollers if you can give him the relevant information, as can Advanced Roller in California. The press appears to be a Sigwalt Ideal, either a model 4 or 5. The stirrup handled models came in two sizes 5” x 7.5” and 6” x 9” as measured on the inner dimensions of the chase. Extremely well made presses. Information is readily available on this site as well as the internet. If the existing rollers are not too hard, cracked or swollen, try printing with the press as-is. If you get decent results you will be able to confirm the roller diameter you wish to order, otherwise you are at the mercy of ordering a “standard size” of which isn’t always correct. When original, rollers were generally made 1/16 - 1/8 inches larger in diam than the trucks; steel wheels which the roller cores ride in. There are a couple sources making rubber rollers on both sides of the US who are familiar enough to guide you to the appropriate (soft) rubber for this type of press. Anticipated cost would be $150-$175 +/- for 2 rollers. 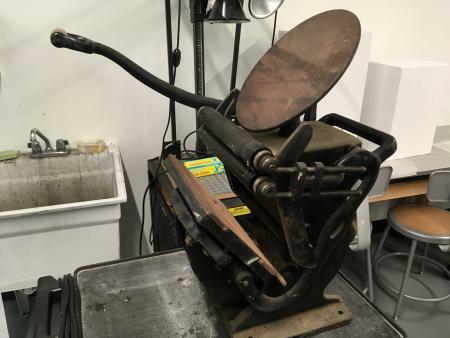 Since you are near enough to a college, it’s likely you would near enough to another printer familiar with this type of table top press. Post your location and I would think someone could give you hands-on guidance if no one at the college is capable. Thank you Butch and Zwack for your input. I live in Rockford, IL, 80 miles west of Chicago. I will share our efforts using the press with the forum and will provide better photos and size info later. Ok, I will agree it is probably an Ideal. If you follow that link above then you will find more resources, like an instruction manual, linked from there. Thanks for the link Zwack.